Welcome to Villa Sarteneja . . .
Villa Sarteneja’s bedrooms have high-beamed ceilings typical of old colonial houses, with both mini-split air conditioners and ceiling fans for your comfort. The kitchen and bathrooms have been renovated with modern fixtures and appliances. Villa Sarteneja features beautiful iron work, screens on every window and over the smaller courtyard. The second, larger courtyard has a deep lap swimming pool and is perfect for entertaining and enjoying Merida’s warm tropical breezes, year round. 100 % cotton linens are provided. A mobile phone is provided. Mini-split, remote controlled air conditioning is provided in both bedrooms and the TV room. 3 bedrooms, 2 with ensuite bathrooms, both with double sinks and showers. 2 private, furnished courtyards, with stereo speakers. 100% cotton linens, bath and pool towels. Remote controlled mini-split air conditioning in each bedroom. Ceiling fans, indoors and out. LED flatscreen television with cable. DVD player with selection of DVDs. Wireless high speed Internet throughout. Kitchen essential utensils, dishes and glassware. Appliances: refrigerator, gas range, microwave, toaster, blender & coffee maker. Washer and dryer. Purified bottled water dispenser. Cellular phone for local calling. Three, secure parking lots within one block. Local, English speaking property manager. We had a most wonderful stay at Villa Sarteneja.The villa was a short walk to everything and the most serene place to return to.All of us thoroughly enjoyed the pool and the outside space.The area is safe,friendly and street parking was easy.Augustin met us on our arrival and immediately made us feel at home.We highly recommend this home for a short or long stay.Thank you to Debra and John for sharing your lovely home. We very much enjoyed our stay at Villa Sarteneja! The beautifully conserved home is comfortable, clean, and charming. 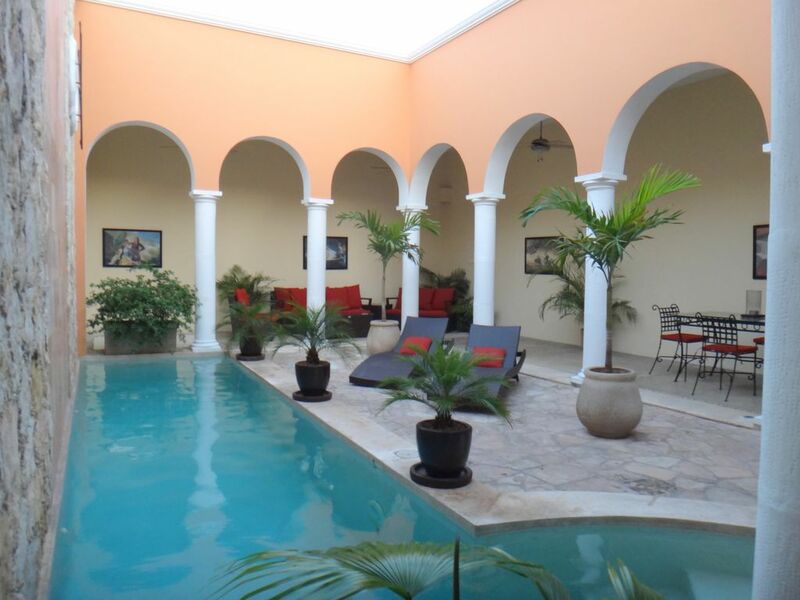 Having a swimming pool in a private home so close to Merida’s main town square is a rare amenity. Would highly recommend this home. Thank you! We spent a week at Christmas in beautiful Villa Sarteneja with our two adult sons and daughter-in--law and granddaughter. The villa fitted us perfectly with 3 bedrooms, and the owner thoughtfully supplied us with a crib. The villa is large with three courtyards and a pool, but you would never know from the street front. Like most Mexican homes, the garden is not on the street. We felt very safe and were able to park our rental car on the street near the house. While in Merida, you don't need a car as Uber will take you around the centro for about 30 pesos (less than $2). Kitchen is adequate, but not well supplied for serious cooking. Tile floors are very slippery and no grab bars or bath mats in shower, which would be a good, and safety, addition. Overall, we enjoyed our stay and highly recommend Villa Sarteneja to others. The house was beautiful with the antique concrete tiles and prints of spanish paintings by Velazquez and El Greco. The layout was ideal as each of our two sons had a room to themselves. The air conditioning was adequate for the bedrooms and the house was surprisingly quiet despite its on street location. We loved it. We spent a wonderful week in the Villa. Its as pretty as shown, with clear lines of its ancient roots, and is a little oasis in a sprawling old colonial city. We walked all over town and felt we were well situated, although a longish 4 blocks from the main plaza into a working class neighborhood. Although Merida is probably as safe as a rural village in Vermont, the neighborhood is not particularly affluent, and might feel edgy until you are there a day or two and feel the good will among locals. So, a good location for us, but a short hike for seniors or guests with disabilities. The rental is well suited to 2 couples. The third bedroom without bath, makes it more of a challenge for more. There are lots or chairs and a dining table around the pool and that is where we spent virtually all of our awake time at home. The other common rooms feel closer around you and less wonderful than the patio and deck area. The kitchen is smallish, but very well stocked with both plastic and glass options - which choice we greatly appreciate around a pool. There are 2 big, high-ceilinged bedrooms with funky but spotless and fine bathrooms. The 3rd BR - through a slight French doorway from the 2nd BR - is similar, but the two room really operate better as a suite for parents and perhaps a few smaller children, with the bath at one end. As a stand alone 3rd room, you'd have to actually walk through someone else's bedroom, or through 2 interior rooms, to your bath. For two couples, with or without a few kids, this is an amazing value in an amazing destination. Divine Villa Sarteneja in the heart of Merida’s Centro district. Just perfecto! What can we say??? Wow! The pictures of this gorgeous Villa just don’t do it justice. The place is just beautiful with all its rustic Mexican/colonial charm. We stayed at Debra and Johns Villa Sarteneja in mid January 2018 during our visit to Merida (as part of our first holiday in Mexico). Debra was kind and helpful from the moment we enquired about the property. After booking, Debra helped us out with all questions we had about the Villa and getting around Merida in general. We even had an issue with a last minute flight change and Debra happily accommodated an earlier check for us. Gracias! On arrival, and after being amazed at how beautful the property was, we were shown around by Agustin (the property manager). Also very helpful. He helped organize a driver for us also as we did a few long day trips in the Yucatan. Perfecto! Everything was as the pictures reflected and more! All rooms were beautiful, spacious with high ceilings, fans and air conditioning. Beds very large and comfortable. Bathrooms well equipped with towels and amenities. As was the kitchen, including plenty of drinking water. The back pool and patio area was divine. The pool lit up at night (gorgeous) and the kids enjoyed breakfast at the breakfast bar on the pool patio in the mornings. The location of the property on Calle 66 was perfect and only a very short walking distance to the Plaza Grande, various beautiful parques, Lucas deGalvez market etc and also walkable to the Paseo de Montejo. Recommend taking a horse and carriage ride down the Paseo de Montejo - just beautiful. Loads to do around town, particularly around Plaza Grande. There are so many quaint and charming parks close by (Santa Lucia, Santa Ana etc) surrounded by beautiful restaurants and delicious street food. We were lucky to be around for Merida fest. The streets around Plaza Grande are closed off on weekends and the city comes to life with musicians, Mariachis, stalls and night shows around the Cathedral. Absolutely loved our stay in Merida and Villa Sarteneja! Muchas gracias Debra!! Merida has open markets, street festivals and live music and entertainment at different neighbourhood parks every night of the week. On weekends, visitors can try salsa dancing or enjoy their dinner and music right on the streets, where some areas of El Centro are blocked off from local traffic. For the romantics, there are horse and buggy rides down the beautiful and historic Paseo Montejo, or for those who choose to enjoy the sights on their own steam, bicycle rentals. Merida has excellent restaurants, theatres, museums, and art galleries, all within walking distance in El Centro. Merida is located just 30 kilometers south of the Gulf Coast. Day trips are easily possible both to the Yucatan Gulf Coast or into the center of the Yucatan Peninsula to explore other colonial cities, cenotes or ancient Mayan ruins. Please inquire about monthly and holiday rates. Rates do not include electricity. All stays require an electricity deposit. Length of stay determines exact deposit ($50 for 3 night minimum - adjusted for longer stays - payable upon booking). The meter is read at check-in and again at check-out and consumption is taken from your deposit. Rate includes weekly pool maintenance and housekeeping approximately every 10 days for long term guests. Villa Sarteneja is unsuitable for children under 12 due to the depth of the pool.